With our wedding just around the corner, (Yes! We're engaged! ), I wanted to do something really romantic for our 2014 holiday card. I thought to myself, why not do something really lovey dovey now, while we're still engaged and can still get away with it, (without being judged too harshly), right? Isn't it adorable, or what? 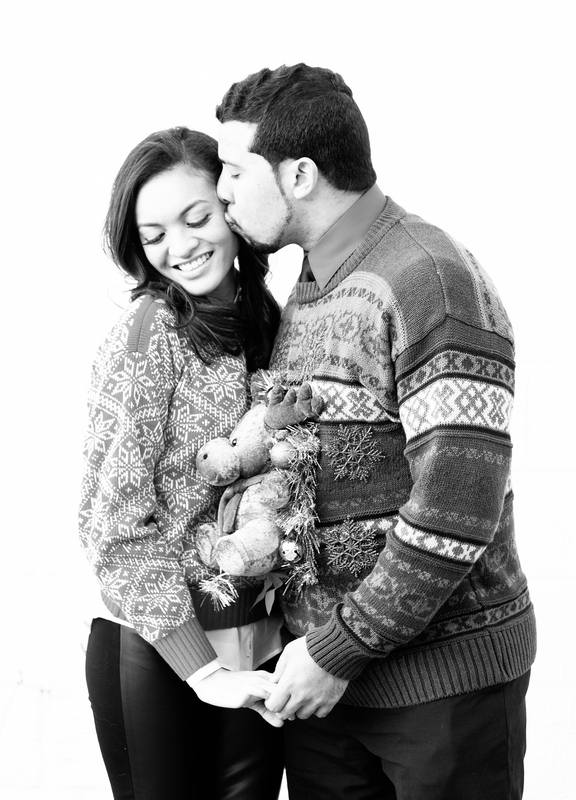 ;) Our amazing holiday photos were taken by none other than Brooke Yannucci of Brooke Whitney Photography. Brooke was such a pleasure to work with--I had explained to her in advance the kind of vision I had for our holiday card, and not only did she take take my requests into consideration, but she also had some great ideas of her own that helped portray our love story. And of course, we couldn't forget Mr. Smooth himself, our little Snack Pack. While he loved being outdoors and around us, (as usual), there were times where all he wanted to do was play with all of his other puppy friends! Happy Holidays from Caroline, Ruben, and Snack Pack! With Christmas just a couple of weeks away, I wanted to share my holiday photo card with you. This year, we got a little creative and did an 'ugly Christmas sweater' themed card! Now, I know it's not exactly Kardashian-family-holiday-card-esque, but I am beyond excited and pleased with our final product. Having professional pictures taken truly makes the world of difference in terms of quality, with a more polished outcome. Besides, a lot of professional photographers will do holiday specials for a lot less than their regular portrait sessions, so why not? Even Snack Pack was on board with the ugly Christmas sweater idea! Where do you buy ugly Christmas sweaters, you ask? Well, there are a handful of websites that sell them, such as Tipsy Elves, Ultimate Ugly Christmas, and even Etsy, but (because I didn't want to spend a lot on something we would probably only wear once,) I just bought ours off of eBay. I didn't spend more than a dollar for my sweater, and Ruben's sweater was only $20. (Plus it lights up too!) Snack Pack's sweater was from PetSmart and cost a little over $10. As for the rest of my outfit? Because my sweater is a statement piece all on its own (as well as the focal point of the photo), I kept everything else simple and understated with a Zara silk blouse, Club Monaco 'Tasha' leggings, and L.A.M.B. 'Oxley II' Pumps.